On Wednesday, November 1st, in a presentation to Greater Sudbury Council, staff and consultants unveiled the Integrated Site Plan for what has come to be called the 'Kingsway Entertainment District'. Earlier, Council had directed staff and hired consultants to develop a site plan for a new casino, hotel and events centre, based on Council's recent decision to locate a new events centre at approximately the Kingsway and Levesque Street – and on letters of commitment that Council was in possession of from Gateway, a casino operator, and from a major hotel chain. Costs for developing the Integrated Site Plan were to be shared on a one-third basis by each of the partners (the City; the casino; and the hotel). Public consultation on design elements took place in the form of two in-person meetings and via online feedback. During the presentation on November 1st, it was made clear to Council that some of the elements being requested by the public were included in the draft design. Marquee elements include ample parking; a Festival Square for outdoor gathering; and the addition of a second ice pad and a new permanent home for the Sports Hall of Fame. These last two elements have not yet been approved by Council and will likely carry additional costs for the development of the events centre, already pegged at costing between $80 and $100 million. from "Integrated Site Plan Presentation", City of Greater Sudbury. November 1, 2017. Other features include a pedestrian bridge to link the events centre to the casino/hotel complex; a loop access road to the Festival Square that could be used by re-routed transit; and a Feature Pond surrounded by green space located roughly between the Kingsway and the back end of the events centre and casino/hotel complex. There was also mention of alternative transportation infrastructure, but the only specifics I heard would be to paint edgelines for cyclists along Levesque Street (and here it needs to be noted that edgelines cannot be considered dedicated cycling infrastructure). Based on the Integrated Site Plan, what staff and the consultants have come up with can be described as two large boxes floating in a sea of parking spaces – well, with greenspace on part of one side. All set back from the street in such a way so as to isolate it from the Kingsway, one of Greater Sudbury's major thoroughfares. In my opinion, the only really interesting element is the Festival Square – a public space that is intended to have hard edges on the northeast and southwest sides (by the events centre to the northeast, and by the casino/hotel complex to the southwest), where the restaurants and small commercial venues might locate. To the northwest, the Festival Square will face the loop access road and, behind that, one of the many parking lots. To the southeast, the Festival Square will face the covered walkway that will connect the events centre and the casino/hotel complex at an above-grade location. Beyond that, to the southwest the Festival Square opens up to greenspace, a parking lot and what appears to be a sidewalk but may also include cycling infrastructure. During the presentation, Toronto's Maple Leaf Square was referenced as an inspiration for the inclusion of the Festival Square. Maple Leaf Square is a decently sized open space located to the west of the Air Canada Centre, home of the Toronto Maple Leafs. It is a seriously successful example of a public space utilized by sports fans and others - but especially by sports fans in support of the home teams that play out of the ACC. It is definitely an public space integrated into the urban neighbourhood. It differs from the proposed Festival Square in several important ways, including its pedestrian nature and the presence of multi-use urban buildings and activities. There are no large parking lots in proximity. 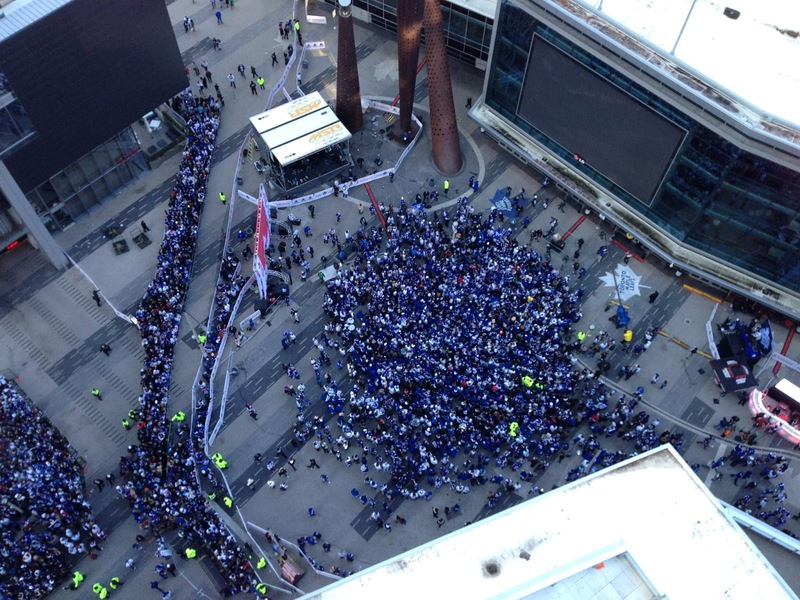 Maple Leaf Square. 680 News, May 14, 2013. All in all, there isn't very much here which is innovative or interesting. To call the design 'car centric' would be to state the obvious. Given the location, though, it's hard to imagine that staff and our hired consultants could have come up with a design that wasn't focused on moving cars around as a top priority. But in all honesty, I expected a lot more than – this. But then again, what did staff and the consultants have to work with? Yes, they heard from the public – and they selectively incorporated some of the things that they heard about. I promise you that they did not include everything that was on the public wish list, because I participated in the public consultation exercise and shared my own wants with City staff. You can read about many of them here, in my earlier open letter to Council (see: “An Open Letter to Greater Sudbury Council Regarding a Kingsway Entertainment District," Sudbury Steve May, July 11 2017 - informed by an earlier piece that expands on the Secondary Plan suggestion, "Mapping the Way Forward for a Kingsway Entertainment District," Sudbury Steve May, June 30, 2017). None of my priorities made the cut. 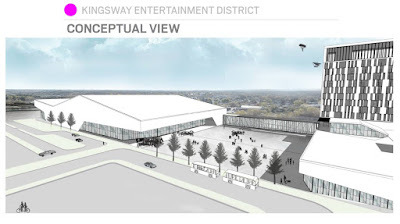 Besides public consultation and the bare-bones direction from Council, where else might staff and consultants have looked for ideas for these first elements of the Kingsway Entertainment District – including the centrepiece of the attraction – a community events centre, bought and paid for by Greater Sudburians via our municipal corporation – a true public facility in every sense of the word. I might have expected staff and the consultants to dust off and open up the City's Official Plan to see if there might be some words of wisdom within regarding how new public facilities should be developed. The Official Plan, after all, is essentially a public promise made by the City to its residents – a policy document that sets out where and how development is to occur. It often includes specific policy directions for certain parts of the City or certain kinds of development initiatives that are deemed critical or of a higher priority. It's informed by extensive public consultation that follows a legislative process. One might think that there could be some interesting ideas and directions for the City to follow contained in the dusty pages of our Official Plan with regards to a $100 million community events centre. I write 'dusty' not because of the age of the Plan, but rather because it is becoming evident to me that our Council seems to have largely forgot that the Plan exists. I realize that many that are presently now on Council were not around in 2006 when the original plan was adopted by a previous iteration of Council. I understand that present councilors might not have taken part in the extensive public consultation exercises that preceded adoption. It may very well be that their lack of involvement in those processes has left them feeling rather, well, unbound by the policy direction articulated in this document. Council has certainly been keen to avoid our Official Plan at almost every occasion as it relates to building a new community events centre. And the Integrated Site Plan is no different. The purpose of the Official Plan is to establish goals, objectives and policies to manage and direct physical change and its effect on the social, economic and natural environment for the twenty year planning period. Actually, the preceding sentence ought to be in quotations – it is, after all, the very first sentence of policy text in the City of Greater Sudbury's Official Plan (note to readers: from here on in, I will put quotes around statements taken directly from the City's Official Plan, and provide references to the Sections of the Plan from which they were taken. I will highlight text that I want to specifically draw your attention to by using a bold font - but all of these highlights are mine, and are not in the Plan). From reading the above text, one might be left with the idea that choosing a location for an $80 million publicly-funded new community events centre and designing a site plan for it – that these initiatives might fall under the purview of the Official Plan. I know that was kind of the direction that I've been leaning in – but our Council has clearly taken a different approach. During the site selection process for the new events centre, four priority sites were selected by consultants PriceWaterhouseCoopers (PWC). While PWC's report referred to the current Official Plan designation for each site, along with the zoning, little reference was made to the actual policies of the Plan. Had PWC taken a close reading of the Official Plan, they would have run into some pretty big ideas about how an events centre is a critical piece of public infrastructure that contributes to the health and well-being of the City, as well as acting as a driver of economic development. The presence of a community events facility is also intended to act as one of several catalysts to spur affordable, low density development in a certain area of the City. Why just one area? Well, the Official Plan really only contemplates a facility like this being located in one area of the City – that would be the Downtown. Indeed, the Downtown is the only physical sector of the City singled out in the Official Plan's Vision statement. Goals, objectives, policies and programs found throughout the plan that address issues such as economic development, sustainability, developing quality of place, healthy communities, attracting and retaining a vibrant workforce, promoting arts, culture and entertainment – all point towards making the Downtown an even better, more dynamic locale that acts as the City's economic engine. “The heart of Greater Sudbury, its most urban place, is and will be the Downtown. With the changing role of downtowns, there is a continuing need for appropriate policies and programs to enhance the Downtown as a location of government, commerce, cultural and entertainment facilities. Residential development in and around the Downtown is needed to support new and expanded facilities and amenities.” (from Section 1.4, Context). We all know that the more people living in and around the Downtown, the healthier a downtown it will be. Our Downtown acts as the focal point for the City – not just in terms of jobs, commerce and wealth creation, but also as an actual focal point for Greater Sudburians through our significant expressions of culture, arts and entertainment (think about parades like Santa Claus and Pride; festivals such as the multi-cultural festival and Upfest; arts initiatives like the Arts Crawl; and especially entertainment via the many venues for live concerts and performances, including the Sudbury Theatre Centre, the Sudbury Community Arena, and private venues like Little Montreal and the Townhouse). The Downtown occupies a central location for so much that goes on in our City. It's no wonder that making our already vibrant Downtown an even better place is a goal of the City's Official Plan. 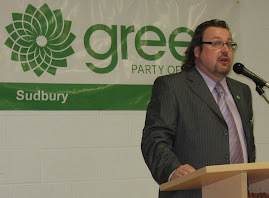 After all, Greater Sudbury has an image to maintain. We are in a competitive marketplace for the jobs of the future. To “facilitate a smooth transition to the knowledge economy” (an objective of Official Plan Section 17.1, Economic Development), there are numerous things which the City promised its citizens it would do. “Improving quality of place is directly tied to the success of our economic engines. Council must recognize the importance of recreation, arts and culture, and cultural diversity for attracting and retaining the creative talent that will contribute to the economic prosperity of the City and its entrepreneurial spirit. Given its impact on the City's image and appeal, the physical appearance of the urban landscape must be improved through a renewed focus on good urban design. Recognizing that quality of life is a key component of its economic development strategy, Council will strive to protect the community's natural environment, to improve its built form, and to enhance its social environment. The development of venues to showcase local and visiting talent, as well as our vibrant ethnic and cultural activities and organizations, is essential to improving quality of place. Special emphasis on creating a youth-friendly city is required.” (from Official Plan Section 17.5, Development Quality of Place). OK, so what does any of this have to do with an events centre on the Kingsway? Don't most of the policies that I've highlighted here pertain to the Kingsway as well as to Downtown? Well, generally speaking, yes they do – but keep in mind: the Kingsway is a designated Industrial area. While the Downtown is intended to be the home of arts, cultural and entertainment facilities. Let's just see what more the Official Plan has to say about the Downtown – especially in the context of attracting and retaining creative talent; the City's image and appeal; quality of life; physical venues tho host entertainment and cultural activities; and creating a youth-friendly City. “Amenities such as the Farmer's Market, Sudbury Theatre Centre, Greater Sudbury Public Library, Sudbury Arena and the Centre for Life contribute to the appeal of the Downtown. 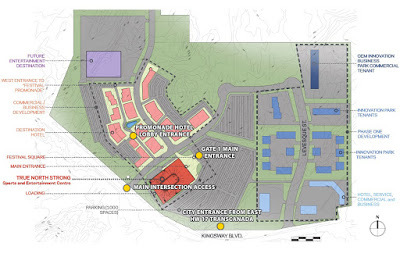 In order to make it more attractive as a place of residence, additional amenities necessary to enhance the livability of the Downtown will be identified.” (From Official Plan Section 4.2.1.1, Downtown Residential Development – note that the presence of the Sudbury Community Arena is highlighted as one of the amenities to be used to fuel residential development in the Downtown). To sum up, the Official Plan recognizes the importance of the Downtown core to the City and wider region, and acknowledges that the health and well-being of the Downtown promote the City's image here and abroad, and is important to municipal initiatives, including economic development. Preserving existing amenities and developing new amenities, such as a community arena, are part of a larger strategy to enhance the Downtown – for all of the good reasons stated. The Downtown section of the Official Plan is riddled with references to image, arts and culture, entertainment, quality of life and economic development. Clearly, all of these aspects of healthy city building are tied together – and come together in a unique way in our City's Downtown. And that's why so many are truly upset that our municipal Council has opted to construct a new community events centre on the urban fringe of the City – accessible primarily by cars and catering to a specific economic elite. In short, locating a community events centre in an industrial park makes little sense in the context of the City's Official Plan – that public promise the City has made to us residents regarding how the City will be shaped in the future. Oh, but the Kingsway Entertainment District isn't going to be an industrial park! Right? No one is contemplating building any industrial enterprises out there. And surely, that is the truth, because although the lands are designated for industrial development, and went through a subdivision process as recently as 2010 for the purpose of creating an industrial park, there just isn't any demand for the municipality to extend servicing to this part of the city. So the lands have been sitting vacant. What to do, what to do. I know! Let's turn this failed industrial site into a new entertainment district! And we'll start with building a new community events centre! And that actually seems to be how all of this has actually come about. Look, maybe this whole Kingsway Entertainment District thing isn't a totally lousy idea. Maybe there is some merit to it. But right now, what's completely missing from the exercise is any articulation of the vision. Turn to that Section of the Official Plan that references 'Kingsway Entertainment District' and you won't actually be able to do it, because it's not there. The comparable section in our Economic Development Plan, 'From the Ground Up” also does not actually exist. There has been no articulation of public policy or programming that actually exists that lays out why the Kingsway Entertainment District would be a 'good thing' for Greater Sudbury – one worth pursuing by Council and the administration, and requiring the use of scarce taxpayer resources. There has been no cost-benefit analysis prepared. There has been no greenhouse gas emission inventory undertaken. There has been no public process to ascertain whether the citizens of this City want to turn our backs on the public promise Council has already made to us with regards to the Downtown, and instead embrace a new concept (well, more like an old concept – one we call 'urban sprawl') as a priority. No policies. No programs. No public consultation. No direction. Just a Council decision that reverses course – one that takes us back to the past, rather than forward into the future. But maybe its what residents really want, costs be damned. But we don't even know that for sure, do we? Frankly, we don't even know what we're really talking about here at all, right? During the presentation of the Integrated Site Plan, one member of Council remarked that he was unhappy to see that the talked-about motorsports park was not included as an element of the Plan. Of course, Council itself didn't direct that this element actually be included, so I'm not sure why the member of Council was surprised. But given that we've all been hearing about how a motorsports park is intended to be a part of this Entertainment District, perhaps the Councilor could be forgiven for thinking that maybe the consultants might have included that element in the Plan anyway. Goodness knows that they included a couple of items that were never on Council's list for the Integrated Site Plan – including an extra ice pad and a location for a Sports Hall of Fame. And what about that waterpark? Soccer dome? Mini-golf? Go-kart track? Zip line? Large Hadron Collider (ok, that one comes courtesy of Steve Ripley, and might not have been on anyone else's list)? Weren't many of these features cited by some on Council as factors that influenced them to vote against putting an events centre in the Downtown and instead moving our community facility out to the Kingsway? In my opinion, the City should have never considered any site for the development of a new community events centre other than those that were within the Downtown. The Official Plan makes it pretty clear that it is a priority of the City and we residents to have this community facility located in the downtown. Whether you might personally agree or disagree with that statement is really immaterial – what is relevant is that when Council voted for the Kingsway, it failed – absolutely failed – to keep its promise to we residents. You might be curious, though, in a way that our Council hasn't been, about what the Official Plan currently envisions for the 'Kingsway Entertaiment District' lands. Let me summarize. The lands are primarily designated “General Industrial”. And keep in mind - no one at the City is talking about changing this designation for the community events centre use (although the City is contemplating an Official Plan amendment to permit a casino to locate on the site, as a casino is clearly not a permitted use on the Kingsway Entertainment District lands - or anywhere else in the City). “Permitted uses may include: manufacturing, fabricating, processing and assembling of industrial and consumer products, repair, packaging and storage of goods and materials and related industrial activities. Complimentary uses, such as administrative offices, which do not detract from, and which are compatible with, the operation of industrial uses are also permitted. General Industrial uses must have minimal environmental impacts. Any use which may impact surrounding areas and may cause nuisance will be appropriately buffered and screened. Where development occurs in areas that are not fully serviced, only dry industries that generate less than 4,500 litres of wastewater a day may be permitted. Heavy industrial may also be permitted by rezoning.” (from Official Plan Section 4.5.1, General Industrial). You will note the absence of any reference to anything that might sound like a community events centre. Or a casino. Or other kinds of entertainment venues. The only non-industrial uses specifically contemplated here are those that are intended to be complimentary and inoffensive to industrial uses – so things like offices and potentially a restaurant. A motel might even be ok – but event that's a stretch, I think. These are the land use policies that are intended to guide development of what we're now somehow calling 'The Kingsway Entertainment District'. These are the policies that the City is using to inform the Integrated Site Plan. These are the policies that were in place when Council voted to locate a community events centre on the Kingsway instead of in the Downtown. As a public promise was made to the citizens of Greater Sudbury about the Downtown via our Official Plan, so too was that public promise made to us that the City would develop the Kingsway lands in keeping with the policies of the Plan. And again, it's no wonder that so many Greater Sudburians are upset – because clearly, Council's decision to locate the community events centre on the Kingsway was a broken promise to residents. It's more than a broken promise, really. It's an abject failure to consider the needs of current and future residents. By opting for the Kingsway over the Downtown, Council demonstrated a lack of commitment to the future health and well-being of the City. To help mend this situation, I wrote to Council and suggested that while I did not agree with their decision, if they were truly serious about wanting to develop lands on the Kingsway as an entertainment district, it would be prudent first to create a policy environment to guide development – and to do it through a public process. I recommended that the City develop a Secondary Plan for this District. I received no response from any member of Council about this proposal. Instead, Council opted to proceed with the Integrated Site Plan, which is intended to inform the zoning amendment that is presently being worked on to permit a community events centre on part of the site. It now seems that it is the goal of the City to have the Integrated Site Plan finalized in mid-November, with the zoning amendment proceeding to Planning Committee by the end of the month. Let's shift gears back to the Integrated Site Plan for a moment. As I wrote earlier, in absence of any specific Official Plan policy direction for the development of a casino, events centre and hotel in the Kingsway location, staff and consultants were kind of left to make things up as they went along – informed by some of the public input that they received, admittedly - but somewhat lacking in policy to inform a direction forward. “The innovative use of new environmental technologies will be promoted, including the development of green buildings, the utilization of alternative heating and cooling methods, and the re-invention of public spaces utilizing recent advancements in eco-sensitive designs.” (from Official Plan Section 4.2.1.2, Downtown Urban Environment). And that's just a sampling, taken specifically from the Downtown portion of the Official Plan. Other design elements are identified throughout the Official Plan in various sections, including the Healthy Community and Urban Design sections. Oh wait – there's an Urban Design section in the Official Plan? What does it have to say about the design of new community facilities? Might there be some guidance there for the development of the Kingsway Entertainment District? What this policy suggests to me is that the City will strive for high-quality urban design at all times – but that it recognizes high-quality design will be difficult to achieve where the developer is a private enterprise. And that also suggests that there is no good reason why a public facility shouldn't strive to have high-quality design elements – especially when that facility is intended to be a marquee facility that helps promote the City's image. One of the objectives of the Urban Design section of the Official Plan is to “promote a built environment that is safe, energy efficient, aesthetically pleasing and productive.” (from Official Plan Section 14.1, Urban Design Objectives). I point this objective out because one of my “asks” was that the community events centre be designed in such a way as to be energy-neutral – to incorporate energy conservation measures along with energy production facilities, such as (maybe) solar panels or wind turbines. A district heating and cooling system (like the one that is in operation in the Downtown) would also go along way to help achieving #NetZero energy neutrality (or better). And I also question whether there is anything 'aesthetically pleasing' about siting a community facility in the middle of a massive parking lot in an industrial area. Espcecially one that is influenced at certain times by constraints from neighbouring land uses. There is one other area of the Urban Design Official Plan Section that I'd like to draw your attention to – and to ask that you keep in mind the layout of the site as proposed by the Integrated Site Plan, and especially the location of the Festival Square public space. “Council will encourage urban design solutions that enhance winter livability. Such methods may include: Fostering building design and orientation to take advantage of climactic conditions and utilizing passive solar heating and cooling techniques; Investigating the feasibility of covered sidewalks at key locations; Encouraging landscaping treatments which enhance winter microclimate conditions and which minimize wind chill level.” (from Official Plan Section 14.2, Community Design). Without question, Greater Sudbury is a Winter City – so it's no surprise to me to see urban design policies in our Official Plan that speak to how best to locate new buildings and other infrastructure in a way that is mindful of the effects of winter. Some Winter Cities, like the City of Edmonton, have developed entire plans to help guide developments and get people thinking about how we can get the most out of our urban environment in the winter time (see: "Winter Design Guidelines: Transforming Edmonton into a Great Winter City," City of Edmonton). While I heard a little bit about how the Integrated Site Plan development process considered the impacts of winter (including setting aside space for snow machines and a desire to connect to snow machine trails), when I look at the Integrated Site Plan, it's pretty clear to me that no one really gave much thought to winter when they put this together. And we here in Greater Sudbury get a lot of winter. Look, I'm no urban designer, but even I know that if you put in a large open space like the Festival Square, and have large openings facing the northwest and the southeast, and then you put two multi-level buildings on either side, you've gone and created the perfect channel for winds to roar out of the northwest right through your public open space. And we get a lot of wind out of the northwest in the wintertime. Further, by putting the taller of the two buildings on the south side of the Square during winter afternoons when the Square could be used most often by the public, the casino will be casting a significant shadow on the Square. Wind and shade is not an enjoyable combination for all-season outdoor space use. Festival Square. From the Integrated Site Plan presentation, City of Greater Sudbury. Winter design guidelines the world over suggest a southern orientation for open spaces. Here, we have one that faces northwest. There is some southern exposure, but the presence of an upper-level pedestrian walkway pretty much means that the focal point of the Square will be its northwestern opening – and that's where most of the people will be accessing the square from, given the presence of the Loop Access Road for buses and the many parking lots to the northwest. I appreciate that the concept design depicts some evergreen trees along the northwest frontier to act as wind breaks, but I question just how successful these trees will be - especially when there is every opportunity to consider a different orientation for the development. Right now, we have a clean slate - let's get this right before we're all standing out there with our kids freezing our collective buns off. Again, I'm not an urban designer or an architect. I don't get paid to think about things like wind channels and shadows. I wasn't on the City's professional team that came up with this Integrated Site Plan – the one that is getting paid about $300,0000. No, I'm just some guy who read a few Winter City design guidelines and is trying to figure out how to reconcile what I've read with what I'm seeing in the Integrated Site Plan. 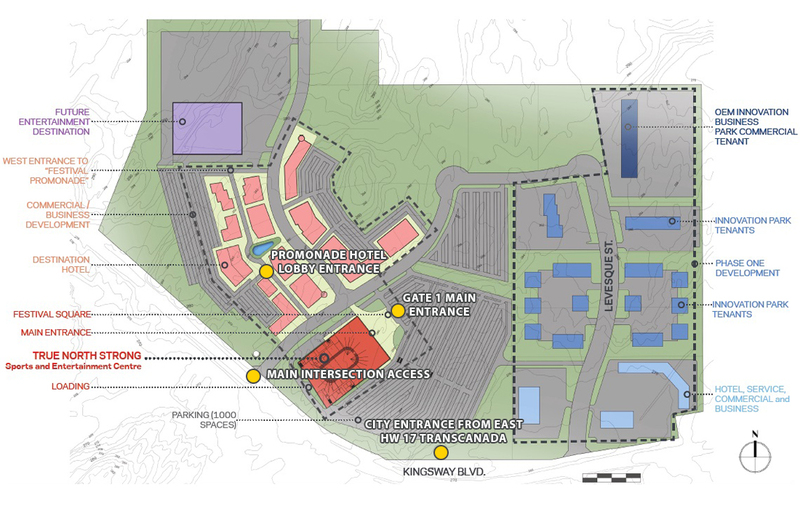 I would have hoped to see a few other things in the Integrated Site Plan, too. Rather than having the parking lots as the central feature that you're going to see from just about everywhere when you're on site, why not orient the casino and events centre to the Kingsway, so that they would largely front on one of our main thoroughfares? Right now, the Integrated Site Plan sets back the buildings significantly from the Kingsway – so that in the future, when you're driving down the Kingsway you'll see mostly just the open space area, the pond and the parking lots. And when you're exiting the casino and events centre, you'll see the Square and beyond that, the parking lots. 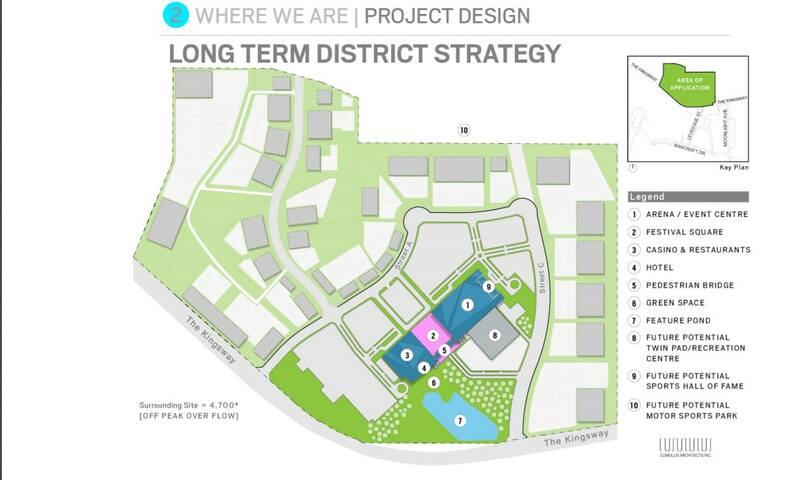 From True North Strong - site plan concept. Although far from good, the original 'design' from the True North Strong people at least contemplated direct exposure of the events centre from the Kingsway, and a bit of a hard edge. By orienting the buildings so that they both face the Kingsway, and are physically closer to it, you could hide the parking lots behind the buildings in the interior of the site. By having the entrances to the buildings face the Kingsway, you could still have a Festival Square by locating it between the two buildings, with a south-facing exterior (one the faces the Kingsway). The Square in this location could be more easily accessed by foot traffic along sidewalks on the Kingsway and potentially from new cycling infrastructure along the Kingsway. Buses wouldn't have to go into the site via side streets and an Access Loop – there could be special bus lanes and bays right off the Kingsway to facilitate transit. And if you wanted to link the events centre to the casino/hotel complex, you could put the pedestrian overpass along the north side of the Festival Square, where it would act as a permeable edge. Now it may be that this kind of orientation is impractical due to stormwater management issues (the pond, to be located near the Kingsway, might have no other place to go). But if there is an opportunity to create a strong edge along the Kingsway by using the buildings themselves and public amenities like a south-facing Festival Square, the City would be remiss to pursue that, in my opinion. So after reading all of this, you might be wondering just how the City is going to work its way through the next step – the zoning by-law amendment. When you go to amend the zoning by-law, municipal officials can't simply ignore Official Plan policies in the same way that Council has been doing. In fact, zoning by-laws are required to conform to Official Plans. With the high test of Official Plan conformity in mind, you may be wondering just how Council is going to justify amending the zoning by-law to permit a community events centre on lands designated for General Industrial development. I know I am. Council might be thinking it has two outs. I understand the arguments, but I don't think they hold much water. Those “policies set forth below” provide a list of items for Council to consider when establishing a new institutional use on lands not specifically designated for Institutional uses. These elements include: sewer and water servicing; traffic; parking; transit; integration of the new use within the larger context of the site; buffering and landscaping. 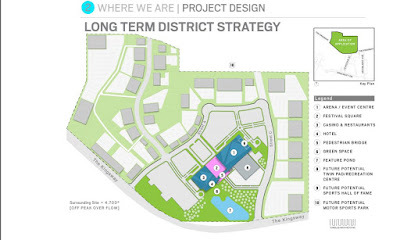 On the surface, there appears to be a very good argument that one might try to make that since Institutional uses can locate anywhere in the municipality, including within General Industrial areas, and since the criteria that Council must consider for that to happen actually consists of elements that Council is considering through the Integrated Site Plan, that should be good enough to locate a community events centre in an industrial area. So all of those policies about how an events centre help create a healthy Downtown and assist with the economic development goals of the City? Yes, Council is going to have to consider those when making a decision on the new events centre – because the multitude of the Plan's policies clearly direct that kind of institutional use (the events centre kind) to the Downtown – a location where other institutional uses, like a recycling centre, may be permitted – but where they would make absolutely no sense to locate. The second matter on which Council may try to hang its hat for a favorable decision related to a zoning by-law amendment would be the existing zoning permissions on this specific site. Back in 2014, Council authorized a by-law amendment for a private commercial recreation centre use – essentially, something that might physically look a lot like the events centre that we're all talking about today. Council may suggest that since that permission already exists (and even after reading the staff report, I frankly have zero idea how that permission conforms to the General Industrial policies of the Official Plan, but Council in 2014 said it did, and no one else said otherwise, so it must conform – somehow) for something that looks the same, what's the problem? The problem here is actually considerable. What Council approved in 2014 was a private enterprise – they essentially gave the landowner permission to go ahead and build and operate a private events centre – one that would compete with the existing Sudbury Community Arena. Presumably, it would also be a facility that made money for the owner – why else would anyone build this sort of enterprise, if not for profit? Anyway, thing is, it never got built – maybe because the owners figured out that they couldn't make money – or maybe it was because of some other reason. Point is, what we're talking about now is a community facility – not a for-profit business enterprise. We know going into this, thanks to the PWC report, that there will be no direct return on our investment. We know that we will be operating this facility at a loss going forward. We know that we aren't building this thing to make money for the City. What we hope is that a new events centre will contribute to our quality of life and act as a catalyst for economic development by stimulating new development in proximity, and creating a more livable community for residents. Of course, a new community events centre would do all of those things much more easily if it were located in the City's Downtown, in accordance with the Official Plan. And that's why the potential argument that 'something-that-already-looks-a-lot-like-a-community-events-centre-has-permission-from-Council-to-locate-on-the-Kingsway' doesn't hold water. In this case, I agree that a private facility looks like a duck – but in this case it does not quack like a duck and is in fact, not a duck. A private events centre, if one were ever built on the Kingsway, would go to profit a private enterprise. A community events centre will be built on the basis of the services it provides to residents - and while it might aspire to turn a profit, it's purpose is not about profit – it's about public amenity. And that is a significant difference. So again, I've no idea how Council is going to justify amending the zoning by-law to permit a community events centre in this General Industrial area. Maybe they'll use this opportunity to reverse course. Right now, Council is only waste-deep in this quagmire – maybe after reading the reports, dusting off their copies of the Official Plan, and listening to the public to whom they made promises that are articulated in the Official Plan – perhaps this will be the opportunity that Council needs to throw the brakes on things, admit that they made a bad decision when they voted for the Kingsway, and reverse course. Sure, that's a hard thing for Council to do. But with voters keeping an eye on things, maybe it's better to admit you were wrong and do something about it, rather than have voters tell you at the ballot box just how wrong you were. Or maybe there is an opportunity for a middle-ground solution. While there are no policies in the Official Plan that I can find right now that support an events centre on the Kingsway, that doesn't mean that there couldn't be. I've already suggested a way forward with a middle-ground approach to Council: the development of a Kingsway Entertainment District Secondary Plan. If there aren't any policies to guide development in the Plan right now, put them in – but do it before zoning and site plan, so that those policies are there to guide those processes. Sure, it may mean an extra year before the project can start rolling forward again – because real public processes take time – but given that this new community facility is going to be one to serve our City for decades – maybe as many as 5 or 6 of them – what's one extra year's worth of time to slow things down and put things a little more right than they are now. If this Council really believes in the merits of a Kingsway Entertainment District, they will get serious about developing this new area – and start to follow established processes to get there. Processes that include public consultation and engagement, and which will address the desire of residents to shift an important City-building public facility out of the Downtown and into a Disney-land type district. That's the kind of conversation that has been completely lacking – but that's the conversation that we're going to have to have if we want to get this right. And judging by the Integrated Site Plan that went to Council on November 1st, there doesn't seem to be a lot of desire to 'get things right'. And that's a shame for our City. I hope Council gets this message – because ultimately, the approval of the upcoming zoning amendment isn't something that they will have complete control over. Additional Notes: In earlier blogposts, I noted that issues pertaining to the presence of threatened and endangered species had not been resolved and should be investigated prior to development. Since writing those blogposts, I have had the opportunity to meet with City staff, and through information communicated to me by Stafff, I am satisfied that there are no identifiable issues pertaining to the presence of threatened and endangered species and their habitat on the lands subject to the Kingsway Entertainment District proposal.